2 or more: $21.33 ea. Fast acting foaming cleaner for all types of hard tile surfaces and grout designed to be used with a variety of application procedures. This special blend of organic and phosphoric acids effectively cleans body oils soap scum and mineral deposits found in shower areas restrooms pools and spas. In food service areas this formula is especially effective in removing heavy buildups of kitchen grease. Restores quarry tile to its original porous condition and increases the slip resistant qualities of the tile, an important feature for the safety minded customer. Foaming action provides superior "cling action" on vertical surfaces. Quickly attacks heavy kitchen greases as well as soap scum and organic soils. 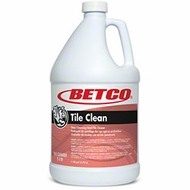 Special blend of non-fuming acids will not attack fixtures or grout.